With MOJO magazine’s #1 Blues Album of 2008, Fall Changes, #2 Blues Album of 2011, Imitate The Sun, and March 2014 Blues Record of the Month and #3 Blues Album of 2014, Live at Jazz Standard, Chris Bergson has established himself as “one of the most inventive songwriters in modern blues music” [Richard Skelly, All Music Guide] , creating his own blend of blues, roots and soul. Born in New York City but raised in Somerville, Massacussetts, Chris Bergson returned to Manhattan in 1995. While backing jazz singers Annie Ross, Dena DeRose, Sasha Dobson and Norah Jones, he released Blues for Some Friends of Mine and Wait for Spring on Juniper Records in 1997 and 2000 respectively. In 2002 Bergson was appointed a Jazz Ambassador of the USA by the John F. Kennedy Center for the Performing Arts and he toured Africa with his trio. Evolving to further embrace the blues while also adding pop influences, he followed up with Blues (2003), Another Day (2005) and his triumphant artistic breakthrough, the widely acclaimed Fall Changes (2007) – MOJO’s #1 Blues Album of 2008 — that established him as an eloquent, evocative and lyrical songwriter with a sharp urban vision. Recorded at Levon Helm’s Woodstock studio, it led to Bergson being personally invited to perform at the famed drummer’s Midnight Rambles while opening the way for more stateside festivals and subsequent tours of Europe. In 2011 Bergson released Imitate The Sun which was named MOJO’s #2 Blues Album of the year, containing six strikingly original songs and four thoughtful covers that allow his fertile creativity free rein. With his regular band of Jay Collins (tenor and baritone saxes, backing vocals, horn arrangements), Matt Clohesy (bass) and Tony Leone (drums, percussion) augmented by Bruce Katz (organ, piano, Wurlitzer organ), Kenny Rampton (trumpet) and Chris Karlic (baritone sax), Bergson makes every track a complete and rewarding musical statement. Live at Jazz Standard, the latest CD release from the Chris Bergson Band, was recorded live over two nights at NYC’s Jazz Standard with Bergson’s usual four-piece band (organ/wurlitzer, bass and drums) “augmented with a horn section expert in the snap and crackle of bluesy soul.” (The Blues Magazine UK) The fifteen song CD was named MOJO’s March 2014 Blues Record of the Month and contains eight brand new original songs, as well as new arrangements of five older originals from the band’s back catalog. Special guests include soul singer Ellis Hooks and a three piece horn section featuring baritone saxophonist Ian Hendrickson-Smith (Sharon Jones and the Dap Kings), tenor saxophonist David Luther (Bettye LaVette) and Grammy Award-winning trumpeter Freddie Hendrix performing horn arrangements by Jay Collins (Gregg Allman). Bergson has performed and/or shared the stage with Hubert Sumlin, Levon Helm, B.B. King, Norah Jones, John Hammond, Etta James, and Bettye LaVette, to name just a few. Blues in Hell (Norway), Harvest Time Blues (Ireland), Groningen Rhythm and Blues Night (Holland), Moulin Blues (Holland), Leicester Blues Festival (UK), River to River Festival (NYC), Joe’s Pub (NYC), The Blue Note (NYC), Jazz Standard (NYC), John F. Kennedy Center for the Performing Arts (DC), Saratoga Jazz Festival (NY), SXSW, Levon Helm’s Midnight Rambles (Woodstock, NY) and opening for B.B. King at B.B. King’s Blues Club (NYC). The strength of Bergson’s songwriting combined with his distinctive vocals and masterful guitar chops have attracted attention from film and television producers for licensing opportunities, with recent placements including Bergson’s song “Goin’ Home” in the feature film Kilimanjaro starring Brian Geraghty, and “Rain Beatin’ Down” for NASCAR Sprint Cup programming on ESPN and ABC. 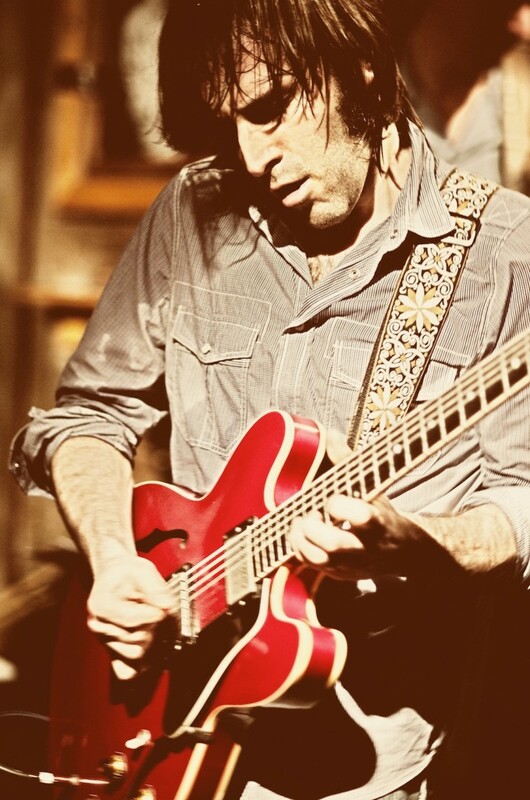 Chris Bergson is a young man on a mission with his blues-breaking guitar, passionate vocals and literate lyrics. He is out to leave an indelible mark on the world of music and succeeding spectacularly with life-affirming art that both consoles and excites. The sum total is an impressive and growing body of work that reaches across the ages and boundaries.